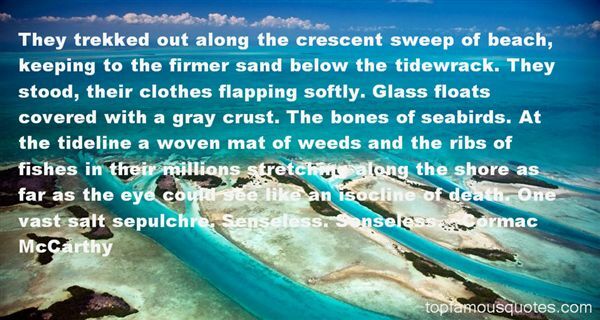 Reading and share top 15 famous quotes and sayings about Sepulchre by famous authors and people. Browse top 15 famous quotes and sayings about Sepulchre by most favorite authors. 1. "They trekked out along the crescent sweep of beach, keeping to the firmer sand below the tidewrack. They stood, their clothes flapping softly. Glass floats covered with a gray crust. The bones of seabirds. At the tideline a woven mat of weeds and the ribs of fishes in their millions stretching along the shore as far as the eye could see like an isocline of death. One vast salt sepulchre. Senseless. Senseless." 2. "The incinerate corpses shrunk to the size of a child and propped on the bare springs of the seats. Ten thousand dreams ensepulchred within their crozzled hearts." 3. "A cloud, hitherto unseen, came upon the moon, and hovered an instant like a dark hand before a face.The illusion went with it, and the lights in the windows were extinguished. I looked upon a desolate shell, soulless at last, unhaunted, with no whisper of the past about its staring walls. The house was a sepulchre, our fear and suffering lay buried in the ruins. There would be no resurrection. When I thought of Manderley in my waking hours I would not be bitter. I should think of it as it might have been, could I have lived there without fear. I should remember the rose-garden in summer, and the birds that sang at dawn.Tea under the chestnut tree, and the murmur of the sea coming up to us from the lawns below.I would think of the blown lilac, and the Happy Valley. These things were permanent, they could not be dissolved.They were memories that cannot hurt." 4. "Walking into the library, I took in my breath sharply and stopped: glass fronted bookcases and Gothic panels, stretching fifteen feet to a frescoed and plaster-medallioned ceiling. In the back of the room was a marble fireplace, big as a sepulchre, and a globed gasolier--dripping with prisms and strings of crystal beading--sparkled in the dim.There was a piano, too, and Charles was playing, a glass of whiskey on the seat beside him. He was a little drunk; the Chopin was slurred and fluid, the notes melting sleepily into one another. A breeze stirred the heavy, moth-eaten velvet curtains, ruffling his hair." 5. "I found a brief piece of by Antonio Vivaldi around this time which became my ‘Pinhead Mood Music'. Called Al Santo Sepolcro (At The Holy Sepulchre), it opens more like a piece of modern orchestral music, and although it it moves toward Vivaldi's familiar harmonies, there is always the threat that it will fall back into dissonance. The piece progresses in an exquisite agony, poised on a knife edge between beauty and disfigurement, joy and sorrow, pleasure and pain. Perfect." 6. 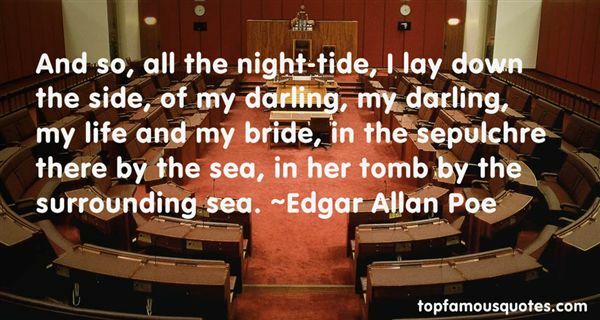 "And so, all the night-tide, I lay down the side, of my darling, my darling, my life and my bride, in the sepulchre there by the sea, in her tomb by the surrounding sea." 7. "For the moon never beams without bringing me dreams Of the beautiful Annabel Lee; And the stars never rise but I feel the bright eyes Of the beautiful Annabel Lee; And so, all the night-tide, I lie down by the side Of my darling- my darling- my life and my bride, In the sepulchre there by the sea, In her tomb by the sounding sea." 8. "And I breathe large at home. I drop my cloak,Unclasp my girdle, loose the band that tiesMy hair...now could I but unloose my soul!We are sepulchred alive in this close world,And want more room." 9. "Mummy dying with it; Christ dying with it, nailed hand and foot; hanging over the bed in the night-nursery; hanging year after year in the dark little study at Farm Street with the shining oilcloth; hanging in the dark church where only the old charwoman raises the dust and one candle burns; hanging at noon, high among the crowds and the soldiers; no comfort except a sponge of vinegar and the kind words of a thief; hanging for ever; never the cool sepulchre and the grave clothes spread on the stone slab, never the oil and spices in the dark cave; always the midday sun and the dice clicking for the seamless coat." 10. "What then is death? If it be a stopping of life, then that is which cannot be. But it may be only a change in the form of life that looks like a stopping, and is not! 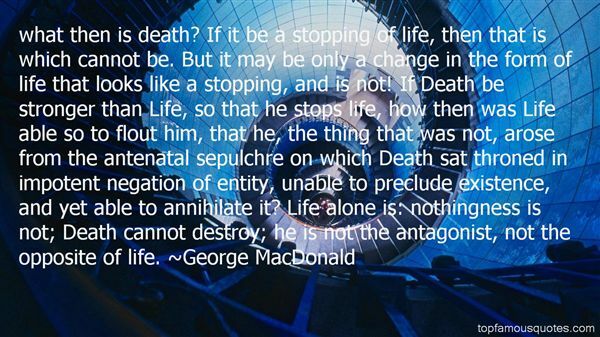 If Death be stronger than Life, so that he stops life, how then was Life able so to flout him, that he, the thing that was not, arose from the antenatal sepulchre on which Death sat throned in impotent negation of entity, unable to preclude existence, and yet able to annihilate it? Life alone is: nothingness is not; Death cannot destroy; he is not the antagonist, not the opposite of life." 11. "No-thing less splendid than a golden sepulchre would have suited so noble a heart." 12. "Just as Christian came up to the Cross, his burden loosed from off his shoulders, fell from off his back, and began to tumble down the hill, and so it continued to do till it came to the mouth of the sepulchre. There it fell in, and I saw it no more!" 13. "... so many nominal Christians throughout history, took no notice whatsoever of the key parable of Jesus Christ himself, which taught that you shall love your neighbour as you love yourself, and even those that you have despised and hated are your neighbours. This never made any difference to Christians, since the primary epiphenomena of any religion's foundation are the production and flourishment of hypocrisy, megalomania and psychopathy, and the first casualties of a religion's establishment are the intensions of its founders. One can imagine Jesus and Mohammed glumly comparing notes in paradise, scratching their heads and bemoaning their vain expense of effort and suffering, which resulted only in the construction of two monumental whited sepulchres. ..."
14. "The Jews sought refuge in their synagogues, but the Crusaders set them on fire. The Jews were burned alive, almost a climactic burnt offering in Christ's name. Godfrey of Bouillon took off his sword and with a small entourage circled the city and prayed, before making his way to the Holy Sepulchre. Next morning, to Tancred's fury, Raymond's men nervously climbed onto the roof of al-Aqsa, surprised the huddled Muslims and beheaded the men and women in another spasm of killing. Some of the Muslims leaped to their deaths." 15. "Thou shalt lie down	With patriarchs of the infant world,—with kings,	The powerful of the earth,—the wise, the good,	35Fair forms, and hoary seers of ages past,	All in one mighty sepulchre. The hills	Rock-ribbed and ancient as the sun; the vales	Stretching in pensive quietness between;	The venerable woods—rivers that move	40In majesty, and the complaining brooks	That make the meadows green; and, poured round all,	Old Ocean's gray and melancholy waste,—	Are but the solemn decorations all	Of the great tomb of man!" That's the way it ends. The thin edge of the wedge."